The new 2013 Mustang GT, which Ford made available in spring 2012, brings a crisper silhouette and a number of overall refinements. Following many of the styling cues of the famous 1970 Boss 302, the new 2013 Mustang GT receives new, more aggressive front and rear styling. The late 1960's and early 1970 models were in the heydays of Ford's pony car styling and really helped define the shape of the big three's factory muscle car look. Long chiseled hoods, with hood scoops or louvers, front air-dam chin spoilers combined with powerful lines along their sides, rising up like haunches as they pass the rear wheel bulges. Whether it was a Mustang, Camaro, Challenger or Charger, these styling cues became synonymous with the term muscle car. And the 2013 Mustang GT has them in spades. Combining these aggressive lines with both, visual and functional new additions, the overall result is a new modern classic. The front grille and fascia have been made to look stronger and more aggressive without appearing boxy, including a new front splitter. 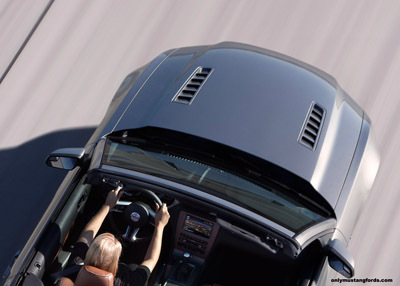 The hood of the new 2013 Mustang GT has received heat extractors that are not only functional, but look good. Further updating the car's crisp new lines are newly added LED bars in front fascia, which, similar to Audi and Mercedes cars, define and stylize the car's headlamp area. Speaking of lights, there's a surprise awaiting you, when you unlock your car at night. Yes, you're seeing right, it's a Mustang pony logo projected onto the ground below your side mirrors. 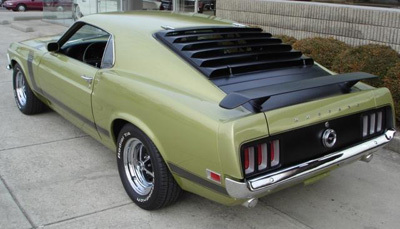 The extra styling touches included changing the previously blacked out rocker area to body color and performing the reverse treatment on the rear tail panel, with a new gloss black panel reminiscent of the 70's Boss Mustang and Mach 1 (minus the flat black honeycomb) cars. And the rear tail light bezels have a new smoked appearance, further blending them witn the new rear treatment. The 2013 Ford Mustang GT specs include some new wheel finishes and styling changes. The standard 18" painted aluminum wheel has had it's design updated. 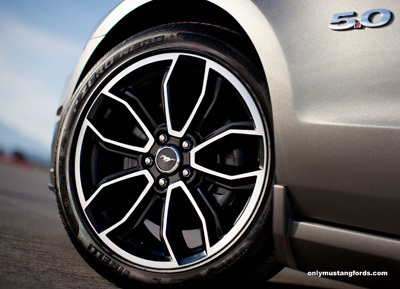 Ford's new optional 19 inch wheel, comes in a gloss black finish, matching the new rear end treatment, and a machined face for a more substantial look. Keeping everything glued to the pavement, are some very nice looking and ground grabbing Pirelli P-Zero Nero performance tires. The overall theme for the 2013 Mustang GT is refinement of the overall package and that includes interior details and specs. The changes you see, are subtle but interesting. The shifter nob, for example, finally receives a much needed facelift, making it much more sophisticated looking and getting rid of it's previously dated and cheap appearance. Other areas that have been upgraded, particularly for performance, include as an option, the very same Recaro® bucket seats, developed jointly between Ford Racing and Recaro® for the Boss 302 and Shelby GT500, which are now an available option on the GT Mustang for the 2013 model year. If you've already read the 2013 Boss 302 story, you'll no doubt already know that the Boss now has the new high tech Ford SYNC® voice activated technology system, which incorporates some new abilities usually only found on much higher priced rides. From the comfort of your own steering wheel, you can easily access voice activated calling via Bluetooth connection, and a USB media input on the optional SYNC systems. That's fine, you say, but you can do that on a bunch of new cars. That's just the starting point. With it's sophisticated voice recognition program and controls, you can do some other cool things, like accessing and controlling some of your favorite mobile apps, receive text messages audibly and even respond with up to 15 preset outgoing messages. If you don't like those choices, you can even use the 8 inch touch screen (yes it has a touch screen) to customize the messages to suit your needs. Personally, I think you'll already having too much fun with that amazing Ford Coyote V8 tucked under the hood, but when you're not out blazing up the asphalt, Ford's optional voice activated navigation system also adds a 10 GIG jukebox, with room for some 2,400 songs and even HD radio. And with the choice of the optional voice operated dvd based nav system, you are going to have at no additional cost, a built in DVD player, simply by popping a dvd into the slot and watching it on the built in 8 inch SYNC console screen. Gotta love technology. Also, once you've completed a quick registration online with Ford, you can access a personalized online report of your vehicle's health, from information provided by the on-board diagnostic and maintenance program in your new pony car. Sound performance has improved as well, with Ford's Shaker system power output bumped up to 360 watts and the Shaker Pro, with 9 speakers and 550 watts of power combined with better sound quality. The 2013 Mustang GT specs receive some upgrades under the hood as well on the still practically new 5.0 liter Ford Coyote engine. 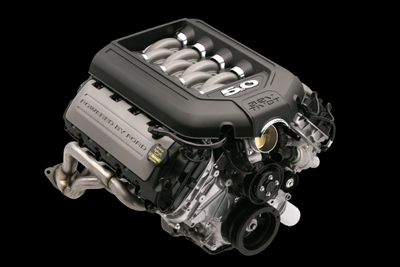 Horsepower for the Coyote engine jumps from a healthy 412 horsepower to an even 420 horsepower and torque specs reach 390 lbs at 4,250 rpm, using lessons learned from the Boss 302. Interestingly, when compared to the Boss, the 2013 Ford 5.0 liter Coyote GT engine, while 24 horsepower short of the Mustang Boss overall, nonetheless beats it's sibling by 10 lb-ft. The other thing that's amazing, is the fact that these incredibly powerful and surprisingly fuel efficient 2013 engines, are both running compression in the 11.0:1 range. That used to be considered race car only territory not many years ago. 2013 Mustang GT weight for standard transmission equipped coupes, is rated at 3,618 lbs and only a few pounds more for the automatic cars, which tip the scales at 3,675 lbs. The well balanced and newly powerful V6 pony cars in coupe form run3,501 and 3,523 lbs for manual and automatic shifting,respectively. The 2013 Mustang convertibles weigh 3,630 lbs for the six speed standard and 3,652 lbs for the automatic, while the GT V8 versions are 3,735 lbs (manual) and 3,792 lbs (auto). These cars may seem heavy, but these numbers for the 2013 Mustang GT weight figures, actually compare very favorably to the V6 powered Camaro and Challenger. Considering dyno tests of the Coyote engine last year showed actual horsepower closer to 450, it will be interesting to see 2013 Mustang GT dyno tests and rear wheel horsepower numbers. And this time, all the fun stuff isn't just available on the Boss, like it was for the 2012 models. This year you can get the cool "Track Apps", which displays important information like quarter mile and 0-60 times and compares them to previous runs. That's not all. Using the 5 way control button on the steering wheel, you can scroll through options displayed on the 4.2 inch LCD screen mounted between the speedo and tach displays and check fuel economy, braking performance and other important information. 2013 brings several new optional packages for the Mustang GT,including a racing oriented GT Track package for manual transmission cars, which combines a 3.73:1 rear axle ratio and Torsen differential from the Boss 302 cars, with high performance friction, beefier radiator and engine cooler, plus the Brembo Big brake package, sporting 14 inch vented brakes and special 19 inch alloys. Manual six speed car buyers also have the new Hill start assist, which holds the brake on the car when it's on a hill for up to 2 seconds, allowing the driver to more smoothly start moving, without worrying about accidentally rolling backwards. The Brembo Brake package is also available by itself on automatic Mustang V8 cars. All in all this is yet another great year for the Ford factory muscle car franchise. 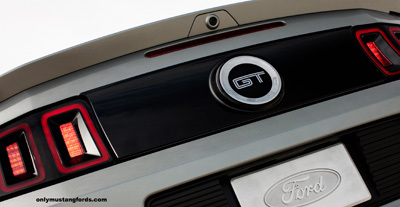 If you've been dying to have a peek at the 2013 GT in action, here's a video courtesy of the good folks at Ford. Take all the good things about the 2013 Mustang GT and add a strong dose of race car. What do you get? The 2013 Boss 302 Mustang of course. With updated specs, styling and new pictures, there's too much to list here. It's all in the 2013 Boss 302 section.